Tennessee’s coaching search might not be going as smoothly as Vol fans would like, but the Vols’ efforts on the recruiting trail continue to pick up steam. On Monday, the Vols made the cut for one of the top prospects in the state of Tennessee. Keshawn Lawrence is a four-star athlete who plays for Ensworth in Nashville. On Monday, he tweeted out his top nine schools, and the Vols were among the teams he listed. Tennessee joins some of the top teams in the country who are currently the favorites for Lawrence. Clemson, Ohio State, Oklahoma, Florida, Auburn, Penn State, LSU, and Virginia Tech make up the rest of his top nine. Get all of our in-depth analysis on Tennessee’s recruiting efforts leading up to the early signing period by becoming a member of RTI Premium today! Lawrence is one of the top players in the state of Tennessee in the 2020 class. 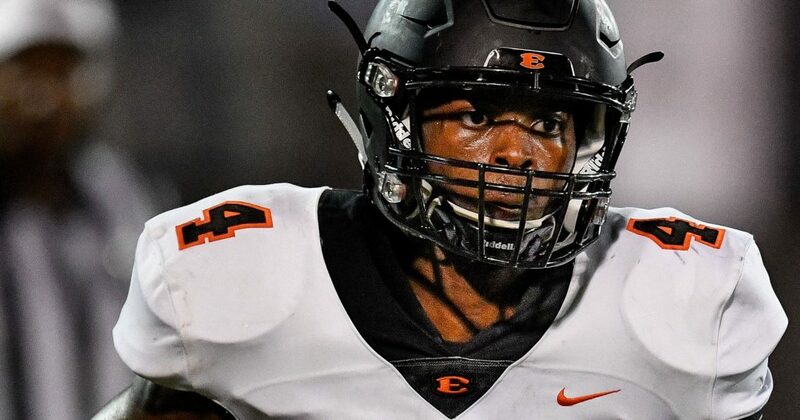 The 6-foot-2, 190-pound prospect is listed as a cornerback by recruiting services, but he plays both offense and defense for Ensworth. According to the 247Sports Composite rankings, Lawrence is the No. 69 overall player in the 2020 class as well as the No. 8 corner and third-best player in the state. The two-way athlete has visited the Vols three times unofficially this year. He came to campus in March to attend a spring practice, and he came back during the summer in July. He also visited during Tennessee’s November 10th contest against Kentucky. He visited Clemson, Auburn, and Vanderbilt during the football season as well. Looking at Lawrence’s film, it’s apparent why most of the top football programs in the country are interested in his services. He’s a gifted athlete who can make defenders look silly on offense with his speed and elusiveness. On defense, he has solid instincts and makes good tackles. He has good pursuit and takes good angles on his highlight film. With his height and ball skills, he could project more as a safety in college than a corner. Or he could go on the offensive side of the ball. Either way, Lawrence clearly has skills and is a very talented athlete on the field. Lawrence isn’t the only highly-rated player from Ensworth in the 2020 cycle. His teammate, defensive end Tyler Baron, is also a four-star according to 247Sports, and the Vols are very much involved with him as well. Tennessee got a huge boost in their 2020 class last week when elite four-star quarterback Harrison Bailey committed to the Vols over Michigan. UT now has four players committed in their 2020 class thanks to Bailey’s commitment. Three-star receiver Antonio Barber, JUCO defensive end Jordan Davis, and long snapper Will Albright are also committed to Tennessee in the 2020 cycle.